On Slieve Daeane there is a passage tomb named Cailleach Bhearra's House, just as on Slieve Gullion, Co. Armagh. The Annals of the Four Masters record that in 1597 Hugh Roe O'Donnell encamped in Breifny of Connaught, to the east of Sliabh-da-en, after having plundered the faithful people of O'Conor. Slieve Daeane is the 1216th highest place in Ireland. 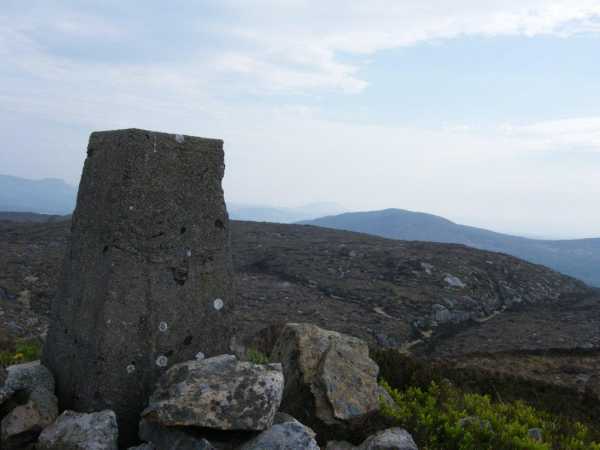 Slieve Daeane is the second most easterly summit in the Ox Mountains area. Forgive me father for I have sinned. It has been over 6 months since I have visited one of Ireland's high spots. Life, the wife, the grand-kids, an on-line course and the weather got in the way. For penance I did 4 local tops to get back in the swing. My boots expired on the 1st top, Slieve Daeane. My trousers ripped on the 2nd, Killerry and it rained on the 3rd, Benbo. Thank goodness I left spare clothing and footwear in the car!